Approximately nine months ago, the U.N.-sponsored peace conference in Djibouti produced the current president of the Transitional Federal Government (TFG), Sheikh Sharif Sheikh Ahmed. President Ahmed's internationally supported unity government continues to be mired down in internal conflict, a conflict rooted in the 4.5 clan system formula. 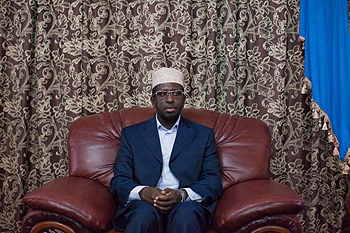 It is a system that remains the most persistent impediment to peace, justice and equality, because it promotes, legitimizes and generously rewards the warlords (and their militias), who for nearly two decades perpetuated violence and chaos and tarnished the credibility of the Somali people and the state. Within this volatile mix are the president's former colleagues who feel profound contempt and a sense of betrayal towards him and his current allies—allies accused of running with the glory of having defeated Ethiopia's brutal forces, which occupied Somalia from December 2006 to January 2009 and humiliated the Somali public. They accuse the president's camp of signing agreements without consultation or the consent of the Alliance for Re-liberation of Somalia (ARS) stakeholders. The Asmara-based alliance,composed of exiled parliamentarians, the Islamic Courts Union (ICU) and members of the Diaspora is an alliance that, while it lasted, was a beacon of hope. The agreement, while applauded by the international community, has left other groups within the Alliance feeling alienated—especially the ICU's military wing (Al-Shabab), who played a crucial role in liberating Somalia—and through their resilience afforded the ARS the credibility to negotiate with the world. Sadly, the ARS has now broken up into multiple groups: Hisbul Islam, Al-Shabaab, and a third group led by Sheikh Ahmed, president of the current "unity government." The breakup has dashed the hope for a peaceful and truly stableSomalia, for it has multiplied the chaos. Compounding the alienation was the Bush Administration's hasty verdict that dismissed Al-Shabab—embraced by Somalis as homegrown fighters resisting a brutal occupation—as a "terrorist" entity, a verdict that proved to be both deadly and counterproductive for all involved. Angry and defiant, Al-Shabab has opted to impose a more violent, rigid rule over the devastated areas it now controls, reportedly instituting the practice of cutting off the hands and the legs of starving civilians accused of thievery, a punishment that (under the circumstance) defies the Islam law. In addition to the Qur'an, Muslims are taught to follow the Prophet's Sunnah and the Sunnah of the rightly guided Rashidite Caliphs (the first four caliphs to succeed Prophet Mohammed after his passing), one of whom was Umar ibn Al-Khattab. During his caliphate, Caliph Umar visited a province within the rapidly growing Muslim society, wherein he found a number of individuals scheduled to have their hands cut off for stealing. Upon inquiry, he discovered their theft resulted from a prolonged famine in the land, and he ordered a commutation of their sentences. He concluded that the failure was not on their part, but rather, their society and leadership had failed them. Disillusioned also are the Diaspora advocacy organizations that launched a peaceful alliance with their brethren in Somalia during one of the most difficult periods in Somali history. They are now caught in a dilemma, victims of the same pitfalls that faltered many before them. It is what some might call "the Kool-aid syndrome," intoxicated with the leader instead of being committed to the cause. Meanwhile, both the number of the internally displaced persons and civilian starvation levels continue to rise, reaching numbers that are reminiscent of 1992. Violence has again increased in Mogadishu, as merciless insurgents take shelter in the epicenter of the civilian population. African Mission in Somalia (AMISOM), with the singular mandate of protecting the government, returns fire with more sophisticated weaponry and far greater devastation—all for the sake of protecting a government that is unable to contain violence beyond a few blocks of Mogadishu, and whose leadership has failed to learn from the mistakes of its predecessor. Alisha Ryu of Voice of America reported Bakara storekeeper Ali saying that the "peacekeepers often respond with indiscriminate fire, causing many civilian casualties." Adding to the complexity of the conflict in Somalia are the latest reports linking the TFG to the recruitment of young boys, mostly from refugee camps surrounding Dadaab, such as the Hagadera and Ifo camps in Kenya, to fight for the government against the insurgents. Ryu reported that a Somali general, Yusuf Dhumal, stated that 1,500 young men were recruited from Kenya on behalf of the TFG and were in a training camp in Kenya to fight alongside the government. This statement was denied by the governments of Kenya and Somalia but later reiterated by the mayor of Gairisa and one of the leading human rights organizations, Human Rights Watch. The mayor of Gairisa, Mohammed Gabow, told Aljazeera, "It's very sad for the Kenyan government to take advantage of the joblessness of our youth and recruit them to fight in a conflict in another country." Additionally, Georgette Gagnon, Africa director at Human Rights Watch, said, "Permitting recruitment of fighters in refugee camps undermines the very purpose of the camps—to be a place of refuge from the conflict. Kenyan authorities need to immediately put a stop to this recruitment drive targeting Somali refugees." Sadly, recruitment of the youth is no stranger to the Somalis. Somali Diaspora youth are today chastised for this sort of response to the call to enlist in the long and arduous struggle against the Ethiopian occupation. Such recruitment will produce an atmosphere that will ultimately result in new groups that can be branded as "terrorists" by the powers that be—just like those before them. To keep the fading hope from dying, President Ahmed and his government must find a lasting solution to the persistent violence, never-ending insurgency and the imbalanced mandate of AMISOM. After all, good leadership is not measured by empty words, endless travel and taking shelter behind heavily guarded buildings, but by the positive and sustainable initiatives implemented in the interest of a leader's nation and people. Sadia Ali Aden is a freelance writer and an activist whose work has appeared in various publications.